You can use the prayer reminders on page 11 to help you remember to pray. Cut out the two reminders, color the pictures, and write down the things you would like to thank Heavenly Father for when you pray. He loves you and hears every prayer. He blesses you with what you need. 1. Prior to sharing time, make three simple signs for children to hold. Use these key words about prayer, writing one word on each sign: Ask, Seek, Knock. Begin sharing time by helping the children find Matthew 7:7, and read it together. Hold up the signs, and review the words with the children. Memorize the scripture together (see “Memorization,” TNGC, 171–72). Bear testimony that we learn about prayer from the scriptures. Sing the second verse of “I Pray in Faith” (p. 14), and review the steps of prayer that are mentioned. Display GAK 305 (Enos Praying) and GAK 403 (The First Vision). Share those scripture accounts about prayer (see Enos 1:1–18; Joseph Smith—History 1:14–20). Allow time for the children to share experiences they have had with prayer. Conclude by singing “A Child’s Prayer” (pp. 12–13), and bear testimony of the power of prayer. 2. Sing the first verse of “I Pray in Faith” (p. 14). Show 3-53 from the Primary 3 picture packet, and share the story about Karolina’s prayer (Primary 3, lesson 26, pp. 123–24). Repeat the weekly gospel principle, “Heavenly Father wants me to pray to Him often—anytime, anywhere.” Sing the first verse again to reinforce the principle. Involve the children in a scripture experience about prayer by preparing a scrambled-word activity (see “Scrambles,” TNGC, 184). Scramble the words in these two phrases: “call upon his holy name” and “cry unto him.” Write the scrambles on the chalkboard, and ask the children to work together as classes to unscramble the phrases. Invite them to look in Alma 34:17–18 to help them find the answer. Explain that these two phrases are ways of describing prayer. Continue the activity by choosing key words (“crops,” “fields,” “houses,” “household,” and so on) from Alma 34:17–27 that name some things to pray about. Scramble the letters in the words, and write them on the chalkboard. Invite the children to unscramble the words, find them in the scriptures, and discuss how this passage of scripture applies to their lives. Sing both verses of “I Pray in Faith,” and bear testimony of the power of prayer. 3. Prior to sharing time, make wordstrips of the different words that children use to say thank you that are found in “Children All Over the World” (pp. 16–17). Be familiar with the song, and be prepared to use it throughout sharing time to teach about prayer. Show GAK 600 (The World). Sing this phrase to the children, and let them guess the last word: “All over the world at the end of day, Heav’nly Father’s children kneel down and ______.” Write the word pray on the chalkboard. Show wordstrips of the different ways children say thank you all over the world. Repeat the words a few times. Sing that section of the song several times so the children are familiar with the words. Write the phrase We thank Thee on the chalkboard. Sing the song beginning with the phrase “Our Heavenly Father hears them.” Ask the children to listen for what Heavenly Father does (hears, understands, knows, loves). Write the four words on the chalkboard. Place these pictures on the chalkboard with the scripture references written under each picture: GAK 107 (Moses and the Burning Bush)—Exodus 3:4; GAK 120 (Enoch and His People Are Taken Up to God)—Moses 6:27; GAK 111 (Boy Samuel Called by the Lord)—1 Samuel 3:10; GAK 303 (Nephi Subdues His Rebellious Brothers)—1 Nephi 2:19; GAK 403 (The First Vision)—Joseph Smith—History 1:17; Primary 5 picture packet, 5-38—D&C 11:23. Ask for volunteers to read each scripture. Teach the children that Heavenly Father knows each of His children by name. 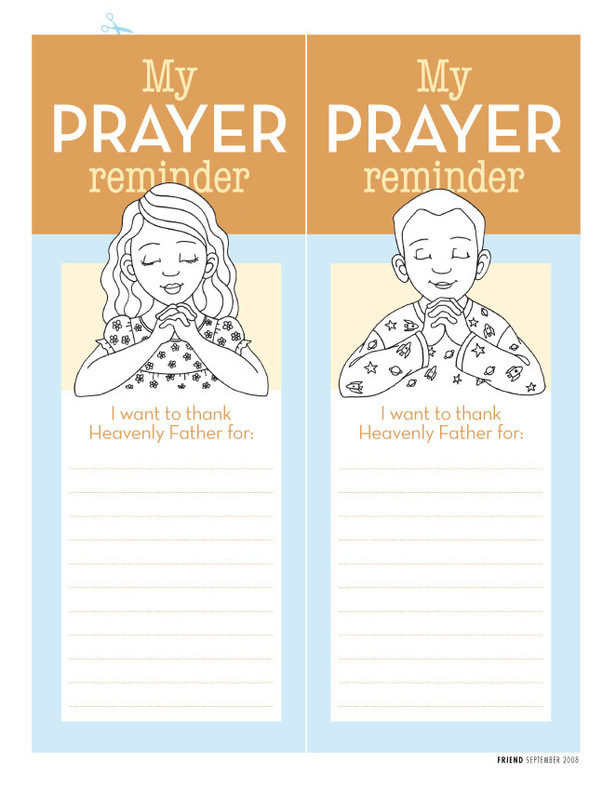 For each child, provide a copy of the prayer reminders found on page 11. Allow time for the children to color the picture. Then talk about things that we can thank Heavenly Father for. From “Children All over the World,” sing the phrase “Saying thank you, thank you in his own special way.” Talk about saying thank you for all the blessings we receive. Sing the entire song, and bear testimony that Heavenly Father answers prayers with blessings that we need. 4. Write on the chalkboard President Boyd K. Packer’s quote from Primary 7, lesson 11, enrichment activity 4, p. 39. Explain to the children that if they listen carefully during sharing time, they will be able to fill in the missing words. Prepare three learning stations where the children are taught that prayers are answered through the Holy Ghost, the scriptures, and other inspired ways (see “Stations,” TNGC, 179). Use music to signal when it is time to move to a new station. Some suggested songs are “Listen, Listen” (p. 107), “Search, Ponder, and Pray” (p. 109), “Love Is Spoken Here” (pp. 190–91), “Follow the Prophet” (pp. 110–11), and “Scripture Power” (Friend, Oct. 1987, 10–11; or 2006 Outline for Sharing Time and the Children’s Sacrament Meeting Presentation). At the conclusion of the learning stations, gather the children and complete the missing-word activity on the chalkboard. Bear testimony that prayers are answered through the Holy Ghost, the scriptures, and other inspired ways. 5. Friend references: “The Power of Prayer,” June 2002, 8–9; “Pictures and Prayers,” July 2006, 34–35; “Heavenly Father Hears Me,” Sept. 2005, 18–19; “How I Knew,” May 2006, 4–5; “Standing for Righteousness,” Oct. 2006, 8–9; “Melanie’s Prayer,” Nov. 2002, 42–43.